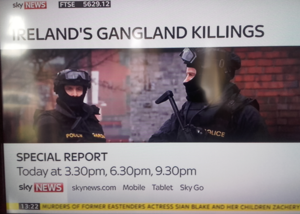 Anything Good On Sky News? Also… was it for this? 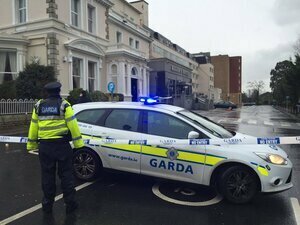 Posted in Misc and tagged Gangland, regency hotel, Sky News at 1:46 pm on February 12, 2016 by Broadsheet. Not so quick to claim them as their own, are they? Just a smidge over the top. Lucinda was calling it a national emergency yesterday. 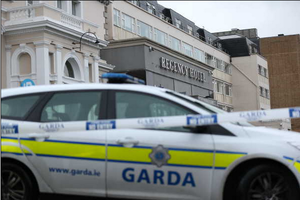 200 killings have happened in last 15 years in Dublin related to these gangs. Are they Gardaí? Why does it say “Police” on their vests? Was it for this etc…? It may be a defence for a foreign defendant in court that they didn’t know the angry men pointing guns at them were legitimate law enforcement personnel when they failed to comply with directions (or possibly shot at the guards). As the ERU may well respond to incidents of security alerts on board aircraft where passengers know nothing of Ireland, it should be made clear who they are. Or, the vests already had Police embroidered on them when they were bought, and the lads just got a second patch made for the other side. Their mas embroider them, put a little heart next to their name on the inside and big scary animals on the outside to scare the baddies. rawr!! Well, if the recent case of a Romanian getting off a drink driving charge because he didn’t get the breath tests results in Irish, they may be more likely to complain they didn’t realise they were guards because it didn’t say “Gardaí”…although maybe it says it on the other breast pocket, looking at the guy on the left in the photo. The stormtrooper garb on the ERU (it is the ERU innit?) Is so much nicer than the regular Garda uniform. These guys look like actual law enforcement people, standard uniform is indistinguishable from a local council traffic warden. Maybe ditch the balaclavas and guns for regular beat copping of course. It wouldn’t be an issue if every tuppenny-ha’penny traffic warden and security guard wasn’t issued with a uniform that deliberately puts one in mind of the Gardaí. They were also much more distinctive when they wore smart tunics with metal buttons, but that might not be too practical for modern policing. Ah in fairness, cheap five-sizes too big hi-vis jackets are more in the line of traffic wardens than cops. They look ridiculous on guards. And the poor women guards, the trousers do NOTHING for the female form. 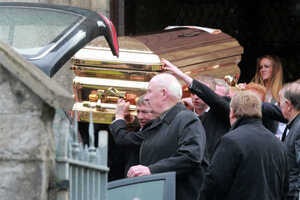 PUBLIC OUTCRY AS ‘GANGLAND’ KILL THEIR MONTHLY QUOTA IN FOUR DAYS. So seemingly there are massive delays in Drumcondra this evening at the Regency where there’s a checkpoint. You don’t see the guards picking up babbies from creche and bringing them over to the car. The childer, as always, are the REAL victims. The roadblocks are a joke. No use. The criminals all have little scumbag kids on stolen bikes working as spotters reporting back where the checkpoints are. And all you have to do is take a bus with your shooter in a bag. They don’t get on and search the buses. It’s ridiculous. Did you learn those tricks from your RA mates? Who on earth says ‘shooter’ outside of Guy Ritchie’s films?